The key to making this dish perfect is using dry beans that have been soaked over night. 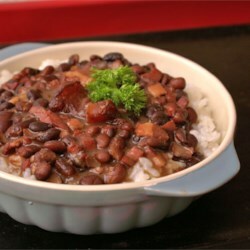 I first made this with canned (Yes, I was lazy) but the canned beans do not give the dish that hearty Brazilian style. I also love the idea of smoked ham hocks which also add to the rich juicy flavor. I squeezed a lime into my version. I happen to like the zing of lime but my family did not. We all love this. Served over white rice. Obrigada.